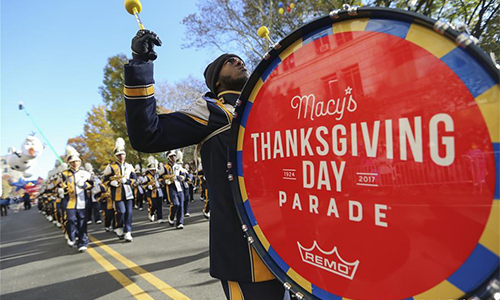 About 3.5 million revelers took to the streets of New York City Thursday for the Macy's Thanksgiving Day Parade as police went all-out to secure the 91-year-old extravaganza, one of the nation's biggest outdoor holiday events. "I'm overwhelmed," Sandy Wang, a Chinese high school student living in the NYC borough of Queens, told Xinhua. "This is my first time to see the grand party.I love Olaf so much." Sandy was referring to the carrot-nosed, helium-happy snowman inflatable from the Disney movie "Frozen." 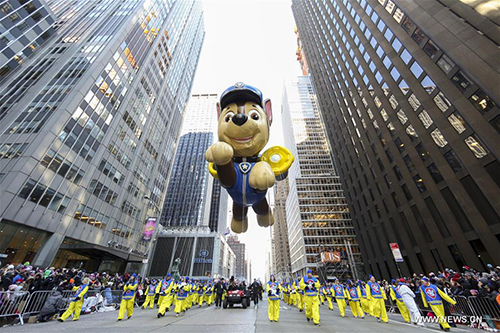 The 60-feet character balloon, which had youngsters giggling and shrieking with delight, stole the show while classic characters like the Peanuts character Charlie Brown struggling to untangle a kite were still popular. 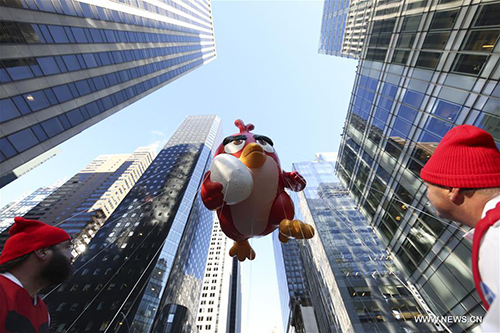 "Thanksgiving has gained more attention in China in recent years, yet I did not expect the parade is so fun," said Sandy, who arrived at the Central Park West avenue where the parade started at around 9 a.m.
For many Americans, the Macy's Thanksgiving Day Parade has been as much a part of Thanksgiving as turkey and football since 1924. 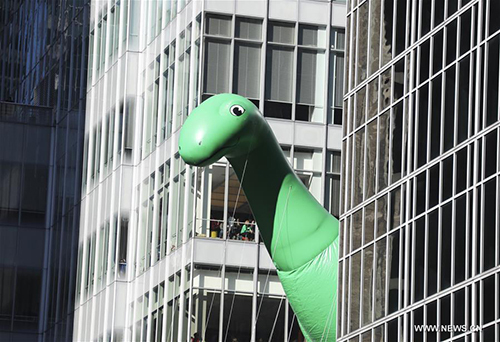 Interestingly, the parade's signature balloons began as a solution to a problem. The events at the first three years featured not floating fantasy creatures, but real ones like tigers, elephants, camels and donkeys from the Central Park Zoo. Instead of entertaining the thousands of children watching, the animals scared them. So organizers in 1927 experimented with a new star: Felix the Cat, oversized and full of air, floating feet above the ground. Now each giant balloon requires around 90 tether-holding handlers to string them along. 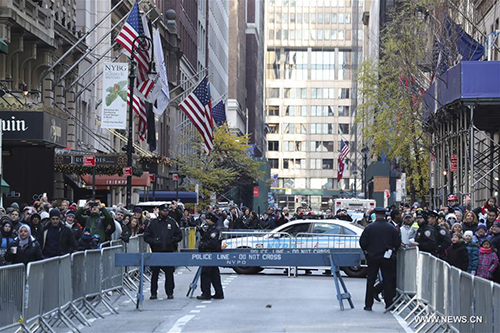 New York Police Department increased security Thursday along the parade route as the parade came after a truck killed eight people when it mowed down pedestrians near the World Trade Centre in October. Police officers with assault weapons and portable radiation detectors were circulating among the crowds, sharpshooters were on rooftops and sand-filled city sanitation trucks were poised as imposing barriers to traffic at every cross street. Each of the 81 blocker trucks weigh 16 tons. Filled with sand, they weigh up to twice as much. NYC Mayor Bill de Blasio and Police Commissioner James O'Neill have also encouraged spectators to say something if they saw something. "Policing is a unique profession and you carry out your duties uniquely well - every day of the year. I know the sacrifices you make, including being away from your own families on holidays like this," he said. The large-scale parade proved to be safe and secure except a group of demonstrators protesting US President Donald Trump's immigration policies, briefly blocking the parade route before cops removed them. The protesters are young people who came into the country undocumented, but were allowed to stay, according to the Seed Project. "I am doing this to bring dignity to our undocumented community, without fear. I want to bring awareness that while some families are together, others are being torn apart," one of the protesters said. The Trump administration ordered the repeal of the Deferred Action for Childhood Arrivals program in September. Attorney General Jeff Sessions in October announced the program would be canceled in March. The US Congress is now considering the measure and debating whether it should be included in a pending budget bill. However, Beth Skwarecki, a freelance health and science writer based in Pittsburgh, the US state of Pennsylvania, lamented the negative impact of the commercialism on the holiday tradition. "What if I told you you don't have to watch bloated characters float by in a gigantic display of commercialism?" Skwarecki wrote. "The whole parade is just one giant commercial, and you know what I do when commercials come on TV? I skip them."